Red Shells are red Koopa Troopa shells that first appeared in Super Mario Bros. Although not their first specific use, they were worn by Koopa Troopas. Unlike the green-shelled Koopa Troopas, they did not fall off cliffs and simply turned around when reaching a ledge. They are the second most common shell, after Green Shells. The Red Shell's first appearance was in Super Mario Bros. They are found being worn by Koopa Troopas. Red-shelled Koopa Troopas appeared later than green-shelled Koopa Troopas. Despite their different color, they act in the same manner as Green Shells. Once tossed, it will continue until jumped on or dropped down a cliff. This may prove as a valuable projectile, defeating most enemies, but may damage the player when it is touched while moving. Super Mario Bros.: The Lost Levels returned Red Shells along with Green Shells. Little or nothing was changed about the behavior of Red Shells in this game from Super Mario Bros. Turtle Shells, or simple shells, are the only type of shells in Super Mario Bros. 2. They are found in grass rather than on Koopa Troopas. The player can throw it at enemies just like the vegetables in the game. It will continue sliding until it hits a wall, then it will disintegrate rather than bounce back. It is possible, with some difficulty, to actually ride the shells by getting on top of it. They replaced the blackface head-like objects known as "Big Face" (ビッグフェイス) from Yume Kōjō: Doki Doki Panic to avoid perceived racism. Red Shells returned in Super Mario Bros. 3. They acted in the exact same manner as in Super Mario Bros., except they could now be carried and thrown, rather than just kicked. In Super Mario World, Yoshi can spit out fire while in possession of the Red Shell. Red Yoshi can use this ability from any shell color. Also, Red Shells can only be obtained by stomping a Koopa Troopa out of its shell, making it become a Beach Koopa. If a Beach Koopa returns to its shell, it once again gains possession of the red shell. Red Shells appear once again in New Super Mario Bros. Again, they are only obtained by defeating Red Koopa Troopas who hold the shell. No change has occurred between New Super Mario Bros. and in Super Mario Bros. regarding functions. Red Shells reappear in Super Mario Galaxy as an offensive weapon. Like the Green Shells in the game, Mario can only hold the Red Shell, not ride it. If Mario throws a Red Shell near an enemy, it will home in on that enemy until it hits something. Underwater, it allows Mario to swim faster and with greater ease. It can also be thrown at underwater creatures and home in on them as well. The other variety of shell that appear in Super Mario Galaxy are Gold Shells, which act like Red Shells when thrown. Red Shells reappear in New Super Mario Bros. Wii as a projectile. Little or no change has occurred between the game and its predecessor regarding functions. Red Shells appear again in New Super Mario Bros. 2, once again as a throwable weapon. Nothing major has changed, though if the player runs through a Gold Ring and there is a Red Koopa Troopa in the area, they will turn Golden, as does their shell. Once thrown, the shell produces a trail of coins behind it. Red Shells appear again in New Super Mario Bros. U, where they act in the same way as in the previous games, Giant Red Shells also appear. Red Shells appear in Super Mario 3D World not as a item, but as a color swap for the Green Shell when Mario is inside it. Other colors include Pink Shells and Blue Shells. They also appear in the second Boom Boom battle, here Boom Boom uses them to attack Mario while he uses his spin attack. In the Mario Kart series, Red Shells have the ability to home in on the opponent whose rank is one higher than the user's. Red shells can be picked up in sets of one or three. When the triple variant is used, three Red Shells rotate around the driver's kart upon usage, (all games except Mario Kart: Double Dash!!) protecting them from Bananas and other shells. If the driver collides with another driver using Triple Red Shells, they will be hit by one, and if the other driver also has another set of Triple Green Shells or Triple Red Shells, both drivers lose their shells. Triple Red Shells are not used in Mario Kart DS Wi-Fi mode because items cannot be equipped in that mode. In nearly every game of the Mario Kart series, Triple Red Shells were a player exclusive item until Mario Kart 8 Deluxe. The only exception is in Mario Kart 7, where, if the item settings are set to Shells Only, the AI is able to use Triple Red Shells. In Mario Kart DS, the AI can receive Triple Red Shells through stealing from the player using Boo. In Mario Kart: Super Circuit, single Red Shells can be laid behind the player and act as a land mine, chasing after the first kart that passes by, even the user. In Mario Kart: Double Dash! !, the Triple Red Shells are a special item exclusive to Koopa Troopa and Paratroopa (and Petey Piranha and King Boo, due to their ability to have any special item). Also, in Double Dash! !, the three shells are carried in their hands rather than circling around the kart. When the kart is hit by an item, they are left with a single shell. In Mario Kart DS and Mario Kart Wii, red shells may hit the kart on the side, rather than behind them, even if the kart was dragging an item behind them. Also in Mario Kart Wii, if a player was hit and a Red Shell was thrown at them, the shell will slow down so it can hit the player. In Mario Kart 7 onwards, Red Shells are able to trail in the sky, and enter launcher passages (such as Barrel Cannons) to pursue flying racers. This is unlike in older Mario Kart games, where Red Shells, just like Green Shells, fall when thrown in the air, and disappear when they go into launching areas. In Mario Kart 8 and Mario Kart 8 Deluxe, they follow the same rules as in past installments and can also come in singles or triples. However, Red Shells travel slower in the Deluxe version when they lock onto their target, allowing players to outrun them in 200cc. Triple Red Shells can also appear for AI in Mario Kart 8 Deluxe. Red Shells appear in the games Mario Tennis for the Nintendo 64, and Mario Power Tennis for the Nintendo GameCube and Wii. These staples can be used during an Item Battle match, which can be obtained when the player hits an Item Box with the ball over the net. If the player hits the ball after receiving the item, a Red Shell comes out and chases the opponent. In Mario Tennis Open for the Nintendo 3DS, a Red Shell is the emblem for the Shell Cup and appears on its trophy. A tennis racket, uniform, wristbands, and shoes are designed based on this item and are available for Miis to use. A Red Shell makes a small appearance in the NES version of Yoshi, after the player clears level 4 of the B-Type game, rewarding the player 400 points. Unlike the main stream Mario games, Koopa Troopas appear in rarer cases in Super Mario World 2: Yoshi's Island. A Red Koopa Shell could be used by spitting it out, but it cannot be used for making eggs. Just like its preceding game, Koopa Troopas wearing the red shell are a rare find in Yoshi's Island DS. They are used in the exact same manner as in Super Mario World 2: Yoshi's Island. Red Shells also appeared in the Super Smash Bros. series. They were in both Super Smash Bros. and Super Smash Bros. Melee. Unlike the Green Shell, which went in a straight path until it fell off, the Red Shell will stay on one platform, and bounce back and forth hitting anyone who hits it (including the user). They disappear over time, however. The Red Shell is absent from Super Smash Bros. Brawl, Super Smash Bros. for Nintendo 3DS / Wii U, and Super Smash Bros. Ultimate. Red Shells appear in Paper Mario: Sticker Star as the shiny variant of Green Shells. Also, every Paratroopa in the game has a Red Shell on its back. Dream Team Description Use the A Button for Mario and the B Button for Luigi, and kick that shell! In Mario & Luigi: Partners in Time, the Red Shell is a Bros. Item that is used as a weapon against enemies. When the item is chosen, one of the brothers will kick the Shell towards the foe. It will then bounce off the enemy, cause damage, and come to the other player. After each kick, the shell starts moving faster along the ground. Unlike with the Green Shell, which is only capable of dealing 16 hits, the brothers can then repeat this indefinitely until the player misses a kick or all the enemies are defeated during the attack. Also unlike the Green Shell, the Red Shell will move on and target another enemy if the chosen enemy is defeated. When the adult and baby Mario brothers fight together, the babies can sit over the shell and spin upon hitting the enemy, causing extra damage to the foe. The Red Shell reappears as the first of Mario's Bros. 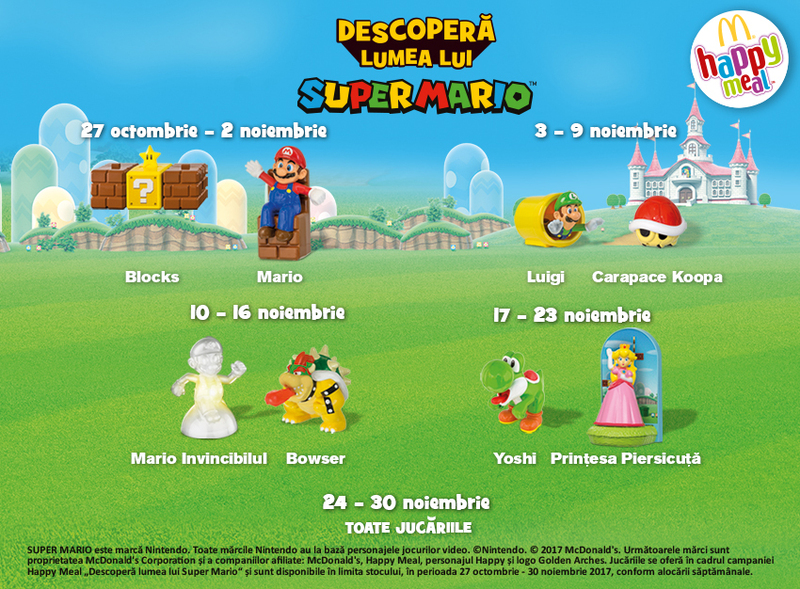 Attacks in Mario & Luigi: Dream Team, under the name 3D Red Shell and it costs 4 BP to be used. The Attack Pieces to obtain the 3D Red Shell are found in Mushrise Park, which are required to all be collected to proceed through the game. It can only target enemies on the ground. The 3D Red Shell is more focused on enemies than its counterpart used by Luigi. Upon using the attack, Mario and Luigi will run into the foreground, where Mario will take out a Red Shell and kick it at one of the enemies. Luigi will kick the Red Shell back at the enemies after it rebounds off the enemy towards him, and Mario will do the same, this repeating three more times. After the Red Shell hits nine times, Luigi will then kick the Red Shell towards Mario, who blasts it at one of the enemies, ending the attack. If all enemies are defeated before the attack ends, it will end prematurely. Striking three, five, nine and ten times with the Red Shell will yield an "OK! ", "Good! ", "Great!" and "Excellent!" rating respectively. Use the A Button for Mario and the B Button for Luigi, and kick that shell! The 3D Red Shell returns in Mario & Luigi: Paper Jam, functioning the same as it did in Mario & Luigi: Dream Team. However, the move is now available from the beginning of the game, costs 3 BP instead of 4, and the attack now damages enemies considerably more, at the cost of being shortened to six hits rather than ten hits. The speed of both the shell and the Bros. moving forward has also been increased. Striking one, three, five and six times with the Red Shell will yield an "OK! ", "Good! ", "Great!" and "Excellent!" rating respectively. A Red Shell appears in Mario Party 3 in the minigame Ridiculous Relay. The first player in the group rows it using an oar. In the Mario Strikers series, the item works very similarly to the Green Shells, which are also found in the games, however, they differ slightly in appearance and effect. They are red, and instead of moving in one direction, they home in on the opposing players. Every time this item is collected, normally is obtained in a group of three. This allows it to home in on three opposing players, however, one will not get hit. These can be used when trying to perform a Super Strike, a Mega Strike, or a Skillshot. There is also a very small chance that the shells might miss the opposing team members, and start bouncing around the stage like a Green Shell. The giant variety of this shell also appeared in the games. It can be useful for clearing room for a Super Strike or Mega Strike. Red Shells appear in the Dream Race event in the Nintendo DS version of Mario & Sonic at the Olympic Games. 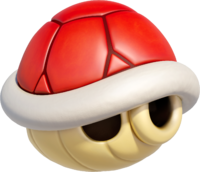 The shells function similarly to those in the Mario Kart series, homing in on an opponent and causing them to lose speed if they are hit, although their effect can be blocked if the player is using a shield. The shells also appear in Dream Long Jump, where they also cause the player to lose height, though can additionally be blocked by using a Starman. They also appear in the Dream Canoe event with a similar function, although if a character is hit by one three of their coins are stolen by the player who threw the item. They come in sets of three, and can be jumped over or have their effect blocked by using a Starman item. Red Shells also appear in Mario Sports Mix. When used normally, they'll chase after an opponent, and temporarily knock out anyone in their path. When combined with a ball/puck, the object will do a curved path at high speeds. The curve can occasionally throw off opposing players. In Monopoly Gamer, a Red Shell face is on the "Power-Up Die". A player who rolls the Red Shell normally can force any other player on the board to drop three Coins on their current space, which can be picked up by the next player who passes over or lands on that space. Some characters have a "Power-Up Boost" that enhances or changes this power. In Animal Crossing: New Leaf, Triple Red Shells appear as special furniture that can be obtained randomly from fortune cookies. When interacted with, they continuously play the Red Shell alarm from Mario Kart DS. In Animal Crossing: Pocket Camp, a single Red Shell can be obtained as a reward for catching five Eep Cheeps in Fishing Tourney #12, which began on March 14, 2019 as part of the Super Mario crossover event for Mario Day. Trading card for Triple Red Shells: "There is a single Red Shell item, but this is three times as good! Triple Red Shells form a protective barrier around your vehicle helping you to fend off attacks. Then they can be fired, forward or backwards depending upon your needs. The difference between Green and Red Shells is that Red Shells will hone in on the closet rival racer. For this subject's image gallery, see Gallery:Red Shell. ↑ Nintendo Power Volume 1, page 9. ↑ Super Mario All-Stars instruction booklet, page 20. ↑ Yume Kōjō: Doki Doki Panic instruction booklet, page 24. This page was last edited on March 29, 2019, at 17:03.